Neil Halstead, Rachel Goswell, Christian Savill, Nick Chaplin, ?? Simon Scott confirmed in an interview that this gig took place somewhere in 1989. This was a three-bill show with Boo Radleys and Slowdive supporting The Charlottes. Pale Saints supported by The Edsel Auctioneer and Slowdive. 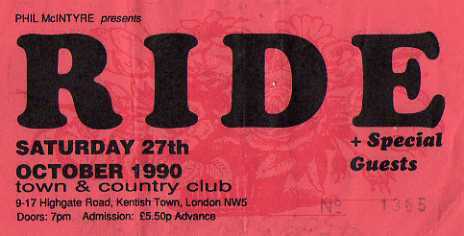 Slowdive and Bleach supported Ride.